Mode Luxury Body Wash is a genuine two-in-one foaming body wash and shampoo – pearly white, richly creamy, packed with nourishing ingredients and laced with a refreshing musk fragrance. We've even added polyquaternium-10, which helps to mend split ends and improve the feel and appearance of damaged hair. Mode Luxury Foaming Soaps are also extremely economical, dispensing just 0.7ml at a time compared with the 1.5ml of traditional liquid soap. They're ideal for offices, factories, hotels, garages and general washrooms. 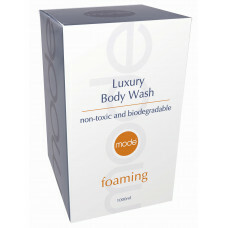 Mode Moisturising Body Wash makes head-to-toe washing a luxurious and relaxing experience. Velv..